The MEN’S GLEE CLUB is the most highly acclaimed of the Naval Academy’s musical organizations and has achieved national prominence as one of America’s premier men’s choral ensembles. Recent appearances on network television include The Kennedy Center Honors (CBS), The Today Show (NBC), The Early Show (CBS), Christmas in Washington (NBC and TNT), Good Morning, America (ABC), and multiple features on PBS. The ensemble has been seen performing in New York’s Carnegie Hall and Avery Fisher Hall, San Diego’s Copley Symphony Hall, and Washington’s Kennedy Center. The ensemble has performed extensively throughout the U.S. and abroad including Chile, Argentina, and multiple European tours with performances at St. Peters in the Vatican, cathedrals in Brussels, Wells, Winchester, Salisbury, and St. Paul’s in London. Performing masterpieces of choral-orchestral literature with many of the nation’s leading orchestras, the Men’s Glee Club’s most recent collaborations include Dallas Symphony, Winston-Salem Symphony, Portland Symphony, Boston Pops Orchestra, Charlotte Symphony, Phoenix Symphony, Columbus Symphony, Jacksonville Symphony, and Nashville Symphony. In addition to the Academy’s annually sold-out concerts of Handel’s Messiah with the Annapolis Symphony Orchestra, symphonic repertoire has included Bernstein's Candide, Mahler’s Symphony No. 2, Requiems by Brahms, Dvorak, Mozart, and Verdi, Haydn’s Creation, Beethoven’s Ninth Symphony, Orff’s Carmina Burana, and Vaughan-Williams’ A Sea Symphony among many others. Additional notable appearances include the Inaugural Concert “We Are One” performed on the steps of the Lincoln Memorial for a live audience of over half a million and an internationally televised audience, the dedication ceremony of the National Pentagon Memorial, the Commissioning of the George H. W. Bush Aircraft Carrier (CVN-77), concert tours of Georgia, Texas, California, Minnesota, Illinois, and Puerto Rico, a performance with Chanticleer, the official JFK 50th Commemoration in Dallas, TX, broadcasts of USNA's annual Messiah performances, a feature as the definitive National Anthem on a P.B.S. documentary, and a highly acclaimed concert at Carnegie Hall. It is with honor, pride and distinction that the Men's Glee Club represents the United States, the Navy and Marine Corps, and the Naval Academy. The Men's and Women's Glee Clubs will be traveling to MINNESOTA to perform with the Minnesota Orchestra! The Men's and Women's Glee Clubs will travel to HONOLULU, HAWAII to perform several public concerts to highlight the talents of the Brigade of Midshipmen and to introduce prospective candidates to the opportunities available to them by attending the US Naval Academy. Sunday, March 10, 2019 - PUBLIC CONCERT! Friday, March 15, 2019 - PUBLIC CONCERT! 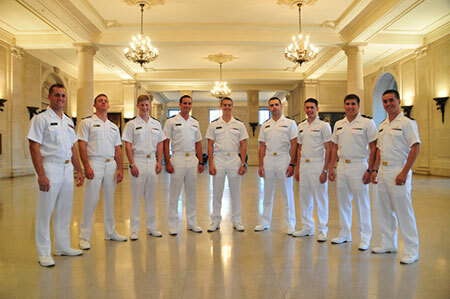 The Anchormen are 9 exceptionally talented members of the USNA Men's Glee Club. While they specialize in more contemporary American music (the general rule for the Anchormen is 1970's "Light Rock" through today's radio hits), they also perform many of the Glee Club's patriotic, nautical, and school songs. Typical "hit" songs include: Follow Me (Uncle Kracker), Footloose (From the Movie), Fly Like an Eagle (Steve Miller Band), For What It's Worth (Buffalo Springfield), Carry On my Wayward Son (Kansas), Sweet Emotion (Aerosmith), M.L.K. (Unknown). Typical patriotic songs include: The Navy Hymn, Navy Blue and Gold, Anchor's Aweigh, etc. The history of Cleanshave dates back to the late 1950's. 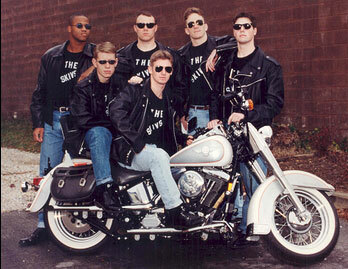 Little did these Midshipmen know that they would begin a tradition that would continue for over half a century. 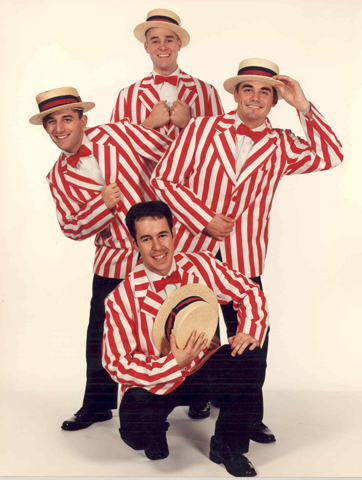 The tradition of barbershop quartet singing arose in the late 1800's and was immensely popular during the 1910's and 1920's. It is a distinctly American music style in which four male voices sing in harmony, unaccompanied by instruments. Barbershop repertoire encompasses popular songs of the gaslight era and the early twentieth century, including ballads and early jazz. It is music that fits into almost any occasion and is well received by all age groups in both formal and informal settings. Typical selections performed: Hello Mary Lou, My Old Man's a Sailor, Your Nobody 'till Somebody Loves You, The Chord Busters, Stars and Stripes Forever, etc. This entertaining group performs the "doo-whop" music of the 1950's and later. Since the early 1970's, The Skivs have performed to the delight and amusement of their audience, often engaging members in the audience while they sing... in leather jackets, sunglasses, slicked-back hair, and blue jeans! Typical songs include: Roller-skate Kate, Rama-lama Ding-Dong, Silhouettes, etc. 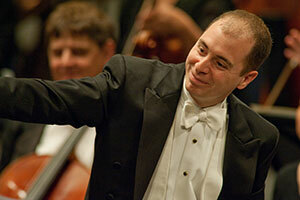 DR. AARON SMITH (Chairman), Director of Musical Activities, accepted his appointment at the United States Naval Academy following a long series of impressive accomplishments as one of New York City's most successful choral conductors and now oversees one of the most visible music programs in the country. A nationally acclaimed conductor, he has been seen in a wide variety of performances and performing venues including Carnegie Hall, Lincoln Center, Kennedy Center, and many other prominent concert halls and churches around the world. Highlight musical collaborations include performances with the New York Philharmonic, Philadelphia Orchestra, Dallas Symphony, New Jersey Symphony, Nashville Symphony, Portland Symphony, Jacksonville Symphony, Orchestra of Saint Luke’s, Kronos Quartet, Chanticleer, the American Boychoir, Mark Morris Dance Group, the Great Performer’s Series, the Mostly Mozart Festival, Kurt Masur, Wolfgang Sawallisch, Sir Colin Davis, Zdenek Macal, Joseph Flummerfelt, John Rutter, and soloists such as Renee Fleming, Stephanie Blythe, Gregory Kunde, and Beyonce. His performances have been heard on multiple television and radio stations across the nation. Additionally, Dr. Smith assisted in the preparation of the Emmy Award nominated performance of the “Live from Lincoln Center” broadcast of Mozart’s Requiem in 2001. He received his undergraduate degree in Choral Music from the University of Texas at Austin, a Masters degree with Honors and Distinction in Choral Conducting from Westminster Choir College in Princeton, New Jersey, and his Doctorate in Choral Conducting from SUNY Stony Brook, New York. Please contact the United States Naval Academy Music Department with any questions or comments you may have.